That hardcover design has my heart. The colors—the purple and the pink—are gorgeous and complements each other, creating a lovely atmosphere. It captured a beautiful moment of a couple chilling with each other. I love that cover has a sun glare that isn’t very strong, but it’s very present at the top. I like that you get the clear sky at the top, but there’s stars on the dark ground at the bottom. It gives such a nice contrast between the top and bottom, and they mesh together well, so that it doesn’t look unnaturally. I love that font. I love that it takes up most of the cover. It’s bold and commanding—exactly what the title sounds. 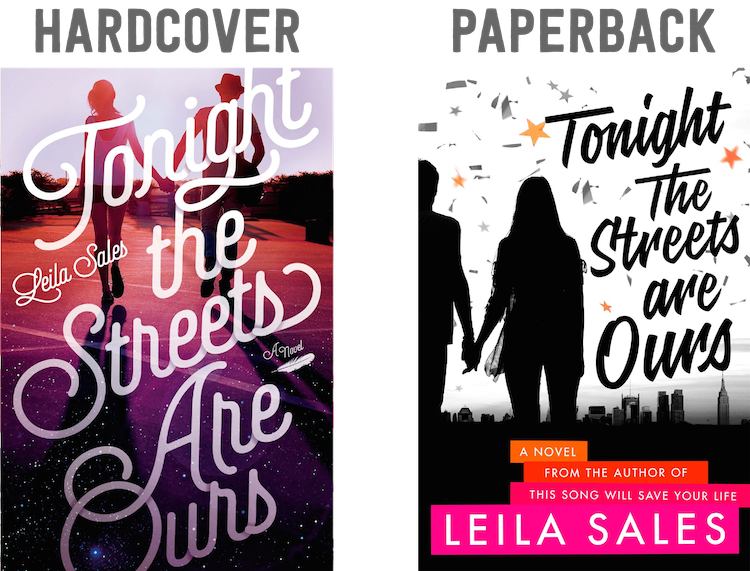 You lose so much in the paperback redesign of Tonight the Streets Are Ours! Where are the gorgeous colors? If anything, I would’ve been okay with the paperback cover if there was color gradient instead of a white background. Have I expressed before how much I hate plain white backgrounds? Because I do, specifically when it doesn’t focus on a particular item or person. I don’t like the silhouettes or the font of the title. It feels cheap and lazy. The only thing I like about this cover are the colors at the bottom. I love how they’re a shade different from each other, but it works. ICK!! That paperback looks so amateur. I don’t know why they would change that when the hardcover was so well liked and so recognizable. Just keep it when it’s good like that!! !